A PHLPost worker shows the commemorative stamps featuring iconic photos of Miss Universe 2018 Catriona Gray. 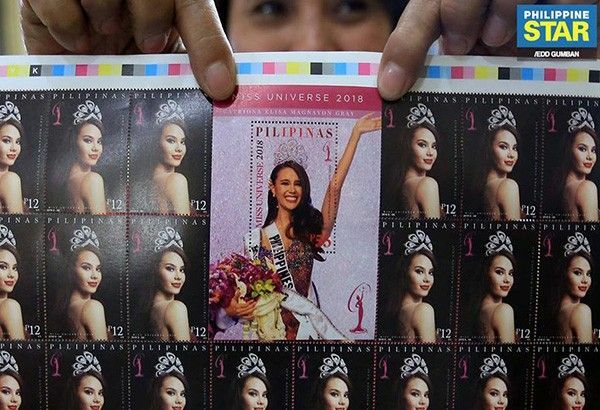 MANILA, Philippines — Philippine Postal Corp., on Tuesday, showed commemorative stamps featuring iconic photos of Miss Universe 2018 Catriona Gray. The stamps will be available to the public on Wednesday for P12 and P55. On Tuesday, Gray went on a courtesy visit to the office of Vice Pres. Leni Robredo and also accepted a senate resolution that congratulates and commends her for being crowned as the country’s fourth Miss Universe.